“Can I wash the sensor pad in the washing machine?” Yes. The sensor pad is machine washable in warm water and do not use bleach. It can also be placed in dryer on gentle setting. Air drying will increase life and function of sensor pad. Make sure to disconnect alarm before placing incontinent pad in washing machine. “Why does my alarm does not sense wetting accidents?” Makes sure the cable is fastened firmly into alarm. Make sure cable is fastened securely on sensor pad. Make sure batteries are functioning by testing alarm makes sound or LED flashes when sliding setting nob from L↔R. Make sure urine is in contact with central area of sensor pad (the sensing area is a circle in the middle of square sensing pad). “The alarm does not make any sound and/or light.” You probably need to replace the 2AA batteries. We strongly recommend using quality batteries to get the longest battery life. Test by sliding the setting nob from L↔R. “I’m trying to train my child not to wet the bed. What alarm setting should I use?” When using the Wet-Detective alarm system for the correction of bedwetting, you should use the medium or loud alarm setting. During the course of using the alarm, parental or adult help may be needed to teach the child to awaken to the alarm. 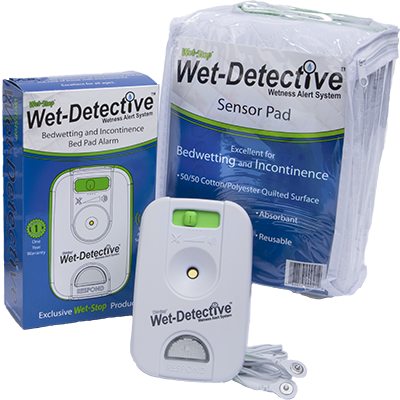 “As an adult with incontinence, how can the Wet-Detective help me?” The Wet-Detective alarm system can be used in incontinence management. The alarm serves to alert that the pad has become wet and needs to be changed. This leads to improved sanitary conditions for those suffering from incontinence, preventing disease and other health-related problems that can be caused by lying on a wet pad for extended periods of time. “What materials are the sensor pad made of?” The sensor bed pad is made of all new material consisting of a 50/50 polyester/cotton blend. “How do I wash my Wet-Detective sensor pad?” The Wet-Detective sensor pad is machine washable in warm water. Tumble dry medium. “Can I use bleach on my Wet-Detective sensor pad?” No, bleach will harm the bed pad. “Can I iron or dry clean my Wet-Detective sensor pad?” No, ironing and/or dry cleaning will harm the bed pad. “Does the Wet-Detective come with a warranty?” Wet-Detective Warranty: The Wet-Detective alarm unit and cable carry a 1 year warranty against manufacturer’s defects in materials, workmanship, and failure under normal use. This warranty does not cover misuse or abuse. If the alarm unit itself becomes wet and no longer functional, this will void the warranty. PottyMD will, at its discretion, repair or replace this product at no charge. This warranty gives you specific legal rights, and you may also have other rights under law. For alarms purchased directly through PottyMD, a proof of purchase such as a canceled check or a dated store receipt must be sent along with the Wet-Detective to be eligible for the replacement or repair. Shipping and handling costs incurred by the customer are not reimbursable. PottyMD reserves the right to change specifications and warranty without prior notice.